Quasdorf Blacksmith & Wagon Museum located in Dows, Iowa. 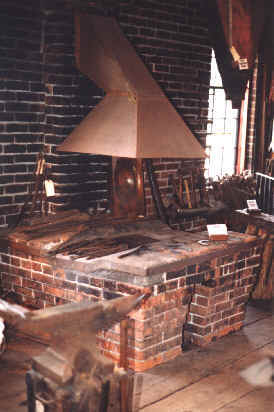 The forge in this shop was a very popular style of brick forge built by rural blacksmiths around the turn of the century. 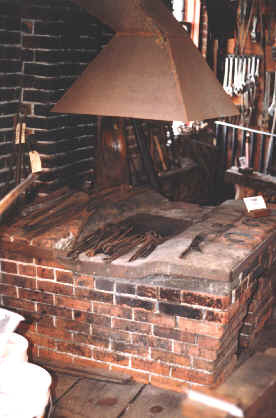 Note that the corbelling (tapering) of the sides of the forge allows the hearth to be quite wide while still allowing the smith to stand close to the fire. It is much less fatiguing to be able to stand with the feet under the edge of the hearth to support ones weight when working in the fire, compared with a forge that has straight sides that force the smith to bend forward or face sideways when working in the fire. A trough is built into the hearth that allows access straight through the fire, and all the way across the hearth. The trough lowers the fire so to help keep the fire deep with a minimum of effort, and at the same time allows the smith to place very long bars through the heart of the fire while the bar extends over both sides of the forge. The forge hearth is wide and has no side edges. An iron band around the top edge of the forge helps keep loose hearth brick together. The firepot is a common factory made cast iron design of the era. Access to the tuyere pipe and ash dump gate are through a hollow built into the front of the brick structure of the front of the forge. The hood is made of sheet metal and directs the smoke into the smoke hole cut higher up the chimney. This particular chimney design is what we refer to as a "water heater" style chimney, in that it is a simple hollow brick structure with no smoke shelf or other appliance inside to aid smoke direction inside of it. the inside of the chimney is roughly 12 inches square. The shop is three stories tall, consisting of a main ground floor where the shop is located, a second story used for storage, and a basement where the engine for the lineshaft was kept. Because the floor was made of wood, foundations were built from the ground up, to support the weight of the forge and chimney, and the power hammer and other heavy structures. Holes were cut into the floor for lineshaft belting to run the power hammer, grinding wheel, and other power tools. This blacksmith shop built farm wagons around the turn of the century as a large part of its business. 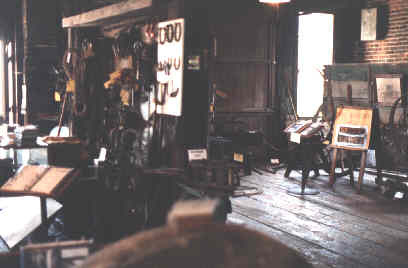 A wood working shop was located in the west half of the shop. The blacksmiths occupied the east side of the building. In addition to wagon making, the blacksmith also made and repaired other agricultural related tooling and implements and shod horses. 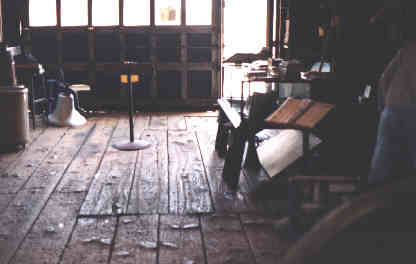 In the front of the shop a dividing wall was erected to partition the east and west sides of the shop floor and tie rings were added to tie horses for shoeing. It can be clearly noted in the shop photos that after a period of time, the flooring beneath where the horses were shod was replaced. No doubt due to the great wear that the horses shoes put to the wooden flooring. Two large doors open both halves of the front of the shop to the street. The blacksmiths office is a tiny little room built into the east wall at the front of the shop. The building has lots of windows for light. At left is the horseshoeing area viewed from the forge. The wooden floor has obviously been replaced most likely from wear and tear of countless horses stomping. To the right of the photo is the dividing wall too which the horses were tied during shoeing. A glass display case now sits in front of the entrance door. At right is another view of the front of the shop from the forge area. This time the dividing wall is clearly seen with tools and museum display items hanging on it. the wagon building area visible to the right. 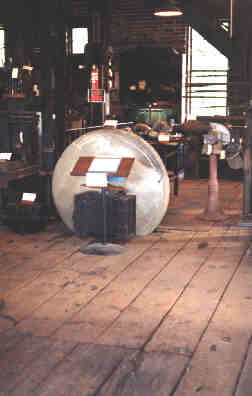 At left is the large belt driven grinding wheel near the middle of the shop on the blacksmith's side. The line shaft belting comes up through a set of holes in the floor to run around a pulley on the back of the grinding wheel. The engine in the basement drives the lineshafting below the floor which runs all the machinery in the shop. The blacksmith converted the machinery to electric motor and shorter belts in more recent times but, the but the museum put the lineshafting back in place to demonstrate the tools the way they were set up originally. At right is a photo of the power hammer used in the blacksmith shop. There were several manufacturers making power hammers in and near the state of Iowa during the turn of the century and many smiths bought their hammers locally. I have lost my notes on this hammer and photos are not clear enough to make out the manufacturer and model number. Quasdorf Blacksmith Wagon Museum, Train and Depot streets, Dows, Iowa, Telephone #515-852-3595. Museum description - Restored 1899 building listed on the National Register of Historic Places holds displays of antique tools, equipment, books and methods of the blacksmith, wagon- and wheel-making, and machine and welding trades. Free admission, wheel chair access. Readers who have knowledge or documentation on this shop are invited to mail the author at the email address below. Latest update March 20th, 2000.